We may be jipped out of a white Christmas in Michigan this year, but the promise of the family rejoined and traditions re-lit has me craving pickled herring. In past years I’ve been lucky enough to receive it––scratch-made––from my Polish neighbor, Krystyna, the week before our family celebrates Christmas and the New Year. This year she’s left Ann Arbor to spend the holidays with her family in South Carolina. I feel like Tiny Tim without a Christmas goose. Wahhhh!!! I could have made the trek to Hamtramck (a historically Polish Detroit area community) and purchased whole herrings (as did Krystyna), and cleaned and pickled them myself. ‘Fraid not. Krystyna and I grew up in very different eras and planets; she, Wloclawik, a town in northern Poland, prior to World War II. Myself, Birmingham, Alabama, on the heels of the Civil Rights movement. There were, however, similarities in our upbringings: Both were times of historical upheaval, and we both enjoyed pickled herring every Christmas Eve. 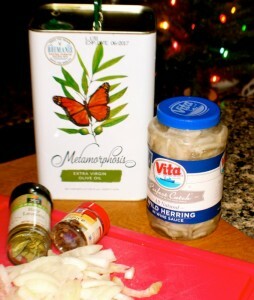 …and make your own herring sauce with fresh ingredients. I’m sharing with you. I’ve never cared for the ready-made, grocery store pickled herring, although it will do when I must have a fix. This version, however, I’ve been gobbling (with Carr’s plain crackers) since I made it several days ago. It’s more flavorful with the passage of time and will keep, refrigerated, up to 3 weeks. Combine, layer with bay leaves and chill several days. 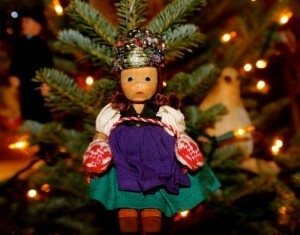 Here’s a link, including recipes, to an interesting piece that details the Polish, 12-course traditional Christmas Eve feast, which includes herring. If you’ve time to spare, have a go at the scratch-made version. I’m serving this with cucumbers sliced on a mandolin tossed with sour cream and fresh dill; black bread crostini and Bloody Mary’s substituting aquavit for vodka. Wishing everyone a holiday season and New Year filled with peace, celebration, and foods that make you feel the love! 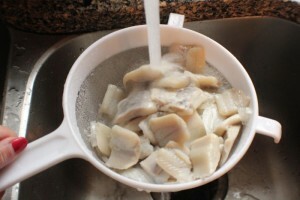 Place herring in a colander and rinse wine sauce off thoroughly under cold running water. Shake colander to remove excess water. 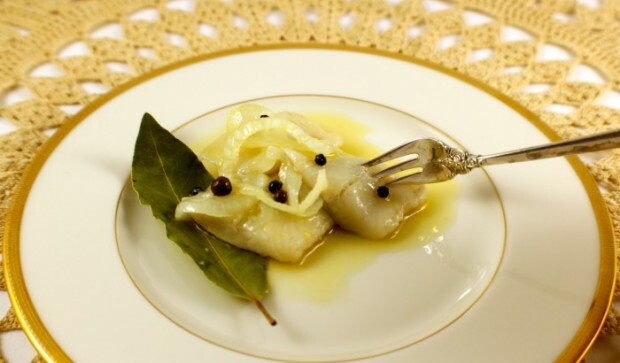 Pour olive oil into a medium-sized bowl and stir in sliced onion, peppercorns, allspice and washed herring. 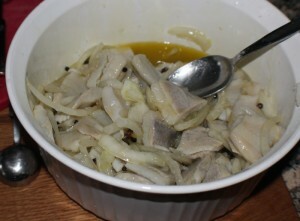 Place 1/3 of the herring mixture, including the oil, in the original herring container (cleaned) or a glass jar. Place a bay leaf over the mixture. Continue this process twice. Refrigerate. This is best eaten, served with dark bread or Carr’s plain crackers, after 3-4 days and is delicious up to 3 weeks. I haven’t a Polish bone in me that I know of but plenty of southern stuff and Alabama kin. Who I hope by the way weathered this past weekends storms alright. Your friend will be well looked after here in South Carolina and I am anxious to make a run to Publix for the herring to make the pickle ones. Love the sound of your recipe and can’t wait to spring it on my DH. Betting he will go nuts! Sour crout is a 5th food group in our house so my mouth is all spitty just thinking of this. Starting the book. I just know it will keep me up all night reading! Submitted on 2015/12/29 at 9:00 am | In reply to Suzanne. Hey Suzanne. We sure have lots in common! Typically, my daughter came for the holidays bearing fresh herring from Chicago–but too late for pickling, and we’ll be enjoying the quickie herring I made through the New Year. Love that comment–my mouth getting spitty! Well put, Suzanne. Well put. I hope you enjoy the read!